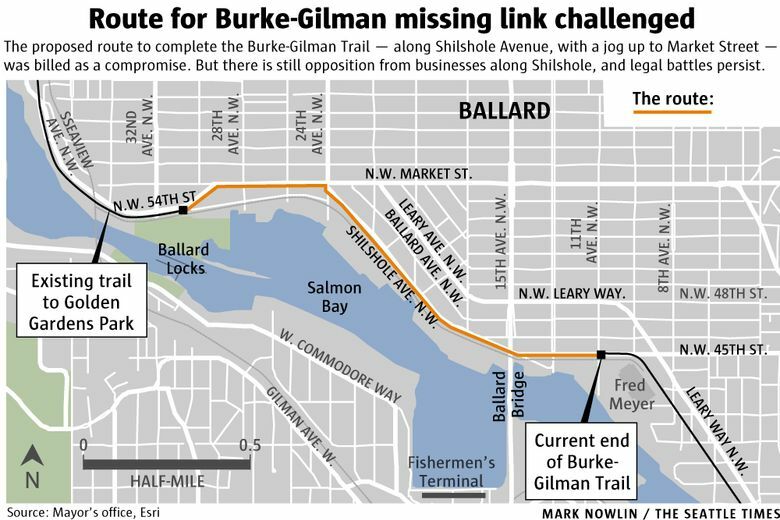 The never-ending saga of how to complete the Burke-Gilman Trail’s missing link in Ballard continues this week, as challengers claim the city’s five-year, $2.5 million environmental study is inadequate. The headline is from 1989. But maybe we should throw it on this article too, because the same trail extension is still being fought. How long can Seattle fight over the precise route that a 1.4-mile stretch of the Burke-Gilman Trail will take through Ballard? Or at least 28 years or so, plus an additional 36 hours this week, spread out over five days in front of a Seattle hearing examiner. The Burke-Gilman, among the region’s most popular walking and biking trails, runs for 18 miles, from Bothell through Fremont, before it abruptly ends outside the Fred Meyer in Ballard. There, bikers are pushed onto trafficked streets, crisscrossed with railroad tracks, before the trail resumes at the Ballard Locks. 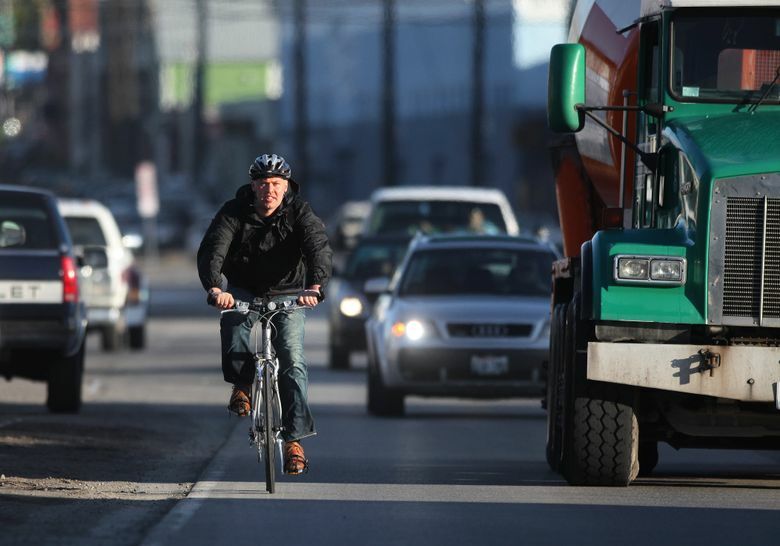 The decades-long debate on how to fill the gap pits cyclists and pedestrians pushing for a more direct route along Shilshole Avenue Northwest against industrial and maritime businesses that argue a trail along Shilshole would disrupt truck traffic and be unsafe. City officials have long favored a route along Shilshole, although a decade of litigation has mostly gone against them, forcing more study and more delay. In February, former Mayor Ed Murray, joined by City Council members, announced an agreement to build the path along Shilshole, but with a compromise zip up to Northwest Market Street (at 24th Avenue Northwest) to avoid some of the trickiest industrial areas. In the past 18 months, the city has also reviewed thousands of public comments, the vast majority in favor of the Shilshole route, and released a 300-page environmental-impact statement on the project, as required by a previous court decision. But while Murray did get several longtime business holdouts on board for the compromise route, a group of businesses and unions, including Salmon Bay Sand and Gravel and the M.L. King County Labor Council, is persisting with legal challenges. Previous court challenges went against the city and forced them to spend five years and $2.5 million on an official environmental-impact statement to justify their preferred route. The Seattle Department of Transportation (SDOT) spent an additional $4.8 million on design work for now-scrapped routes. The hearing examiner is not tasked with choosing between routes, just determining whether the environmental-impact statement is adequate. The coalition of challengers, which includes about two dozen businesses on Shil­shole, says it is not. They say that the environmental-impact statement didn’t adequately consider safety and traffic impacts and that it was essentially reverse-engineered to yield the city’s preferred route. “We hired the engineers and did the analysis SDOT should have done,” said Josh Brower, lead attorney for the challengers. Among other things, they point to an early draft of part of the environmental-impact statement — produced for the city by a consultant — that is much harsher on the economic impacts of the preferred route. After SDOT staff asked the consultant to scale back some of its harsher conclusions, the final environmental-impact statement says that the trail could yield a “slight negative effect” on industrial properties, but that it is statistically insignificant. Karen Westing, a SDOT spokeswoman, said that it was “standard process” for an environmental review to include several versions, including comments from the agency, and that SDOT is “confident in the conclusions” of the final statement. The alternative that the group of challengers proposes — a bike track not suitable for walkers or strollers along Leary Avenue and Market Street — wasn’t even considered in the multiyear studies that got us to this point. Each side will have 18 hours this week to present witnesses and evidence to a city hearing examiner. The city’s route would eliminate more parking spots and cross more driveways. The challengers’ unstudied alternative would cross more intersections and be less direct. Construction on the trail is tentatively scheduled to begin next year, but expect appeals to King County Superior Court no matter who prevails in front of the hearing examiner.